While riding motorcycles can be exhilarating and liberating, they are also extremely dangerous. The federal government estimates that per mile traveled, the number of deaths in 2013 on motorcycles was over 26 times the number in cars. Head injury is the leading cause of death in motorcycle accidents. Motorcyclists face many more risks than other vehicles on the road including decreased stability, lower level of occupant protection, and decreased visibility by cars and other vehicles. Therefore, accidents associated with motorcycles are often very serious with high medical bills and other damages. Motorcyclists should never ride without a helmet. Victims not wearing a helmet are 37 percent more likely to die or sustain catastrophic injuries than someone who is wearing a helmet. Not wearing a helmet could reduce the amount of money a victim receives in a settlement or lawsuit if it is found that any portion of the victim’s injuries were caused by his or her failure to wear a helmet. Motorcyclists should always drive more defensively and avoid potential blind spots, as it is much more difficult for other vehicles to see motorcycle riders on the roadway. What Should You Do If You’re Involved in a Motorcycle Accident? 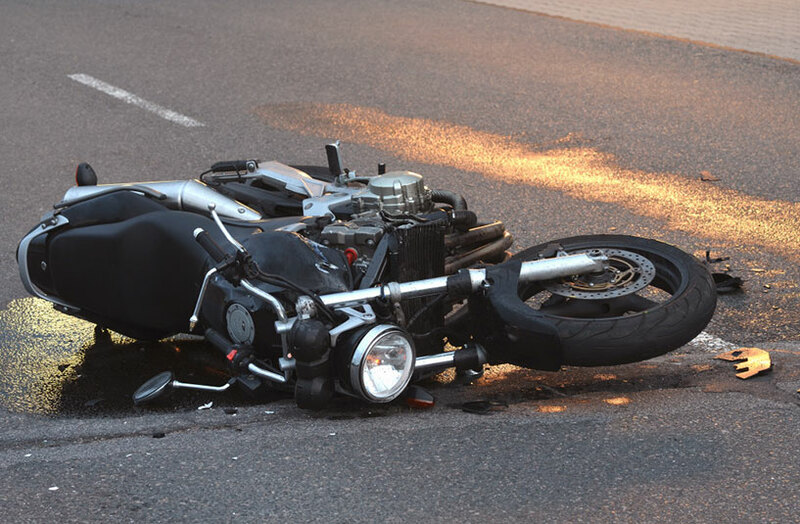 If you are involved in a motorcycle accident in Arizona, the first thing you should do is report the accident to law enforcement and call your insurance company. Never take responsibility for the accident, leave the scene of the crash, or provide a recorded statement to the insurance company. Motorcycle accident victims must show that their injuries were caused in whole or in part by someone who failed to exercise reasonable care while driving on the roadway. A person injured in a motorcycle accident due to no fault of their own is entitled to compensation, including but not limited to past and future medical expenses, past and future lost wages, pain and suffering, loss of enjoyment of life, mental distress, permanency and scarring, and inconvenience. If you or a friend has suffered a motorcycle accident in the greater Phoenix area, Glendale, Mesa, or Scottsdale, please contact Nate today to set up your free initial case evaluation by filling out the online form or by calling 602-652-2009.